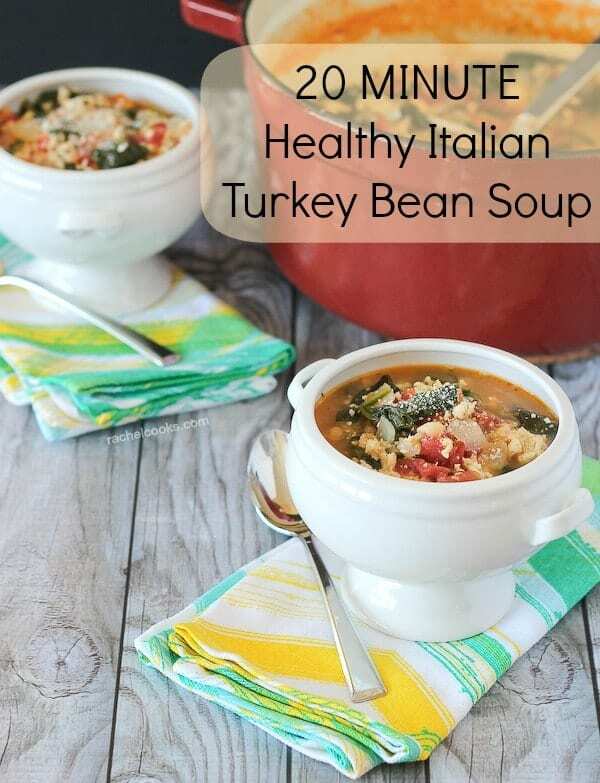 This healthy soup recipe comes together in 20 minutes or less, but it is packed full of protein, vegetables, and most importantly, flavor! Your whole family will love it. Have a stocked pantry — this recipe depends on it. 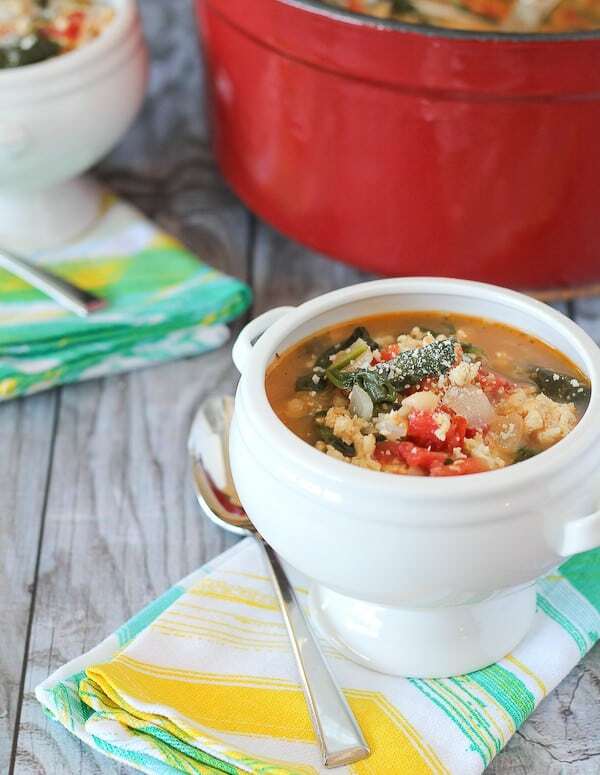 I made this healthy soup recipe using all ingredients I keep regularly stocked in my pantry. The first time. The second time I made it, Ben had to make a grocery store run to restock. 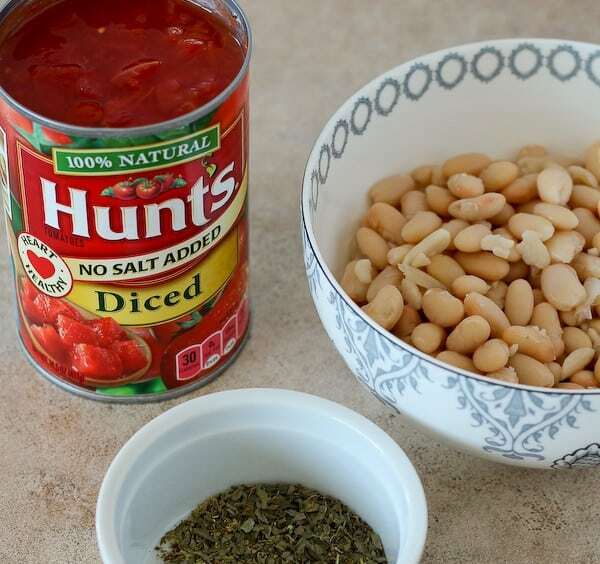 Cans of beans — this recipe uses great Northern but I typically keep black beans and chickpeas stocked as well. Spinach. I always have spinach. Always. If I don’t, I’m headed to the store. Onions. A must have in the fridge. Spices — this recipe uses oregano, red pepper flakes and basil. Olive oil. I always have tons of it. Other staples in my pantry are a variety of grains, pasta, bacon, carrots, celery, a variety of vinegar and some fruit and vegetables in the freezer. But you don’t need any of those for this particular healthy soup recipe. Of course, everyone is different and you might not keep your pantry stocked just like mine. 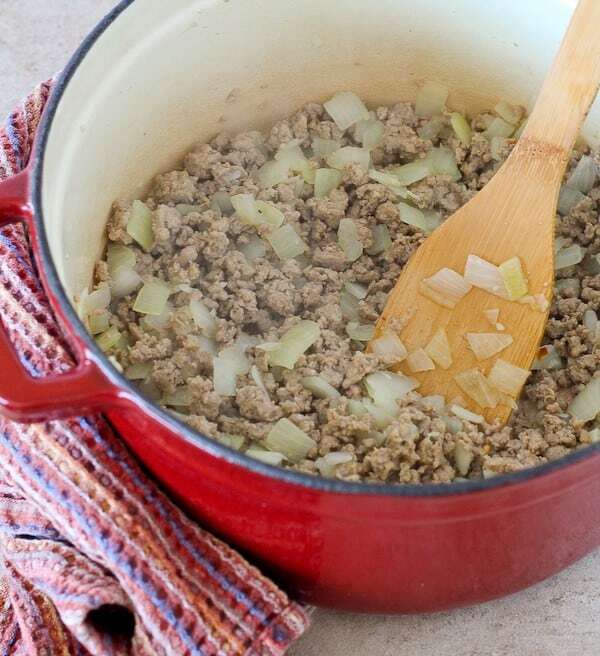 You might not like ground turkey (this recipe would be phenomenal with Italian sausage if you prefer that!). 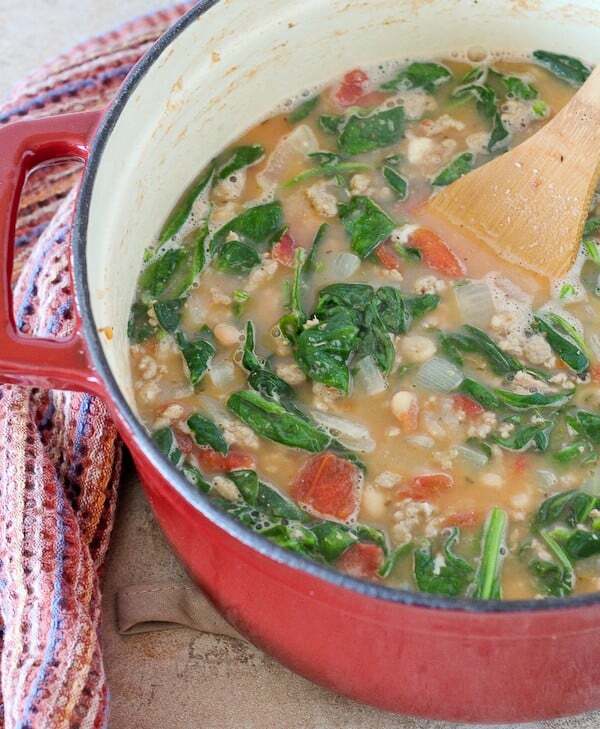 Maybe you don’t have baby spinach — try a different green in this soup such as kale or chard. The really important thing here is that this recipe can be prepared in 20 minutes. I see myself making this A LOT on weeks where I might have slipped behind on my meal planning. Or maybe I had something planned and I just don’t have the time and energy to prepare it. Or it might just not sound good on that particular night. No problem! Out come those pantry staples to save the day. Healthy, easy, and no trips to the grocery store required. I’m pretty sure that’s as good as it gets. Plus it can warm you up on a chilly day. And since spring is NEVER coming…hot soup is a good thing. To make this recipe, you heat up your soup pot with some olive oil. To that, you add your ground turkey, onions, garlic, red pepper flakes, and some black pepper. 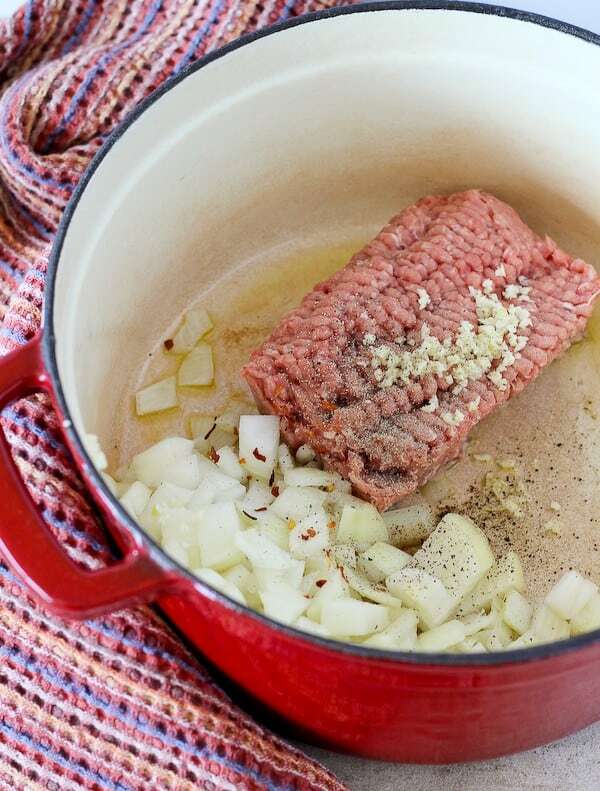 Cook until those onions are translucent and your turkey is fully cooked. 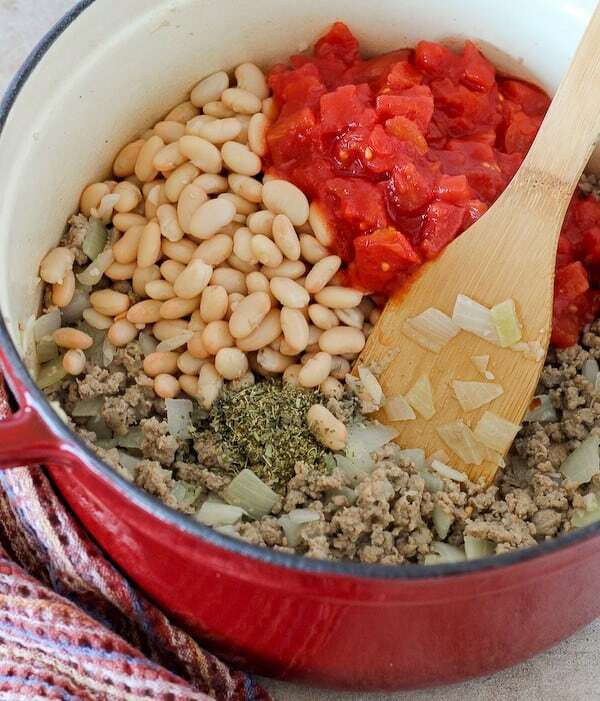 Throw in your beans, herbs, HUNT’s Tomatoes — stir to combine. 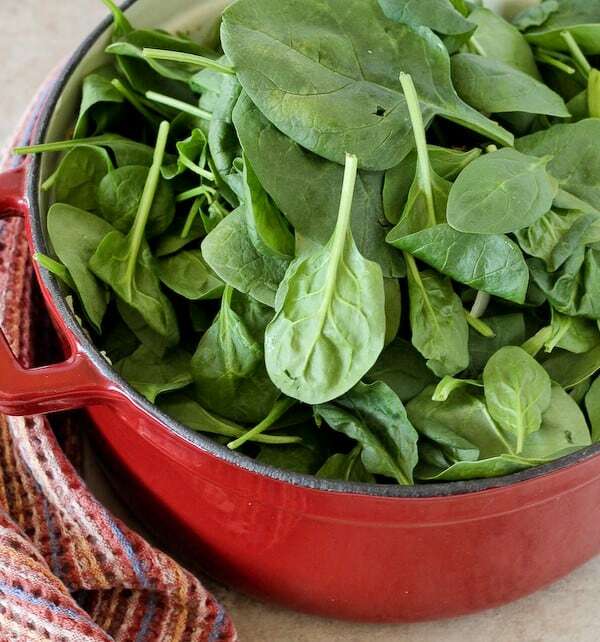 Then you PILE on the spinach. You can do this in batches if need be, but mine all fit in the pan. Cover for a couple of minutes to let the spinach wilt. You might have to stir it a couple of times to help it along. 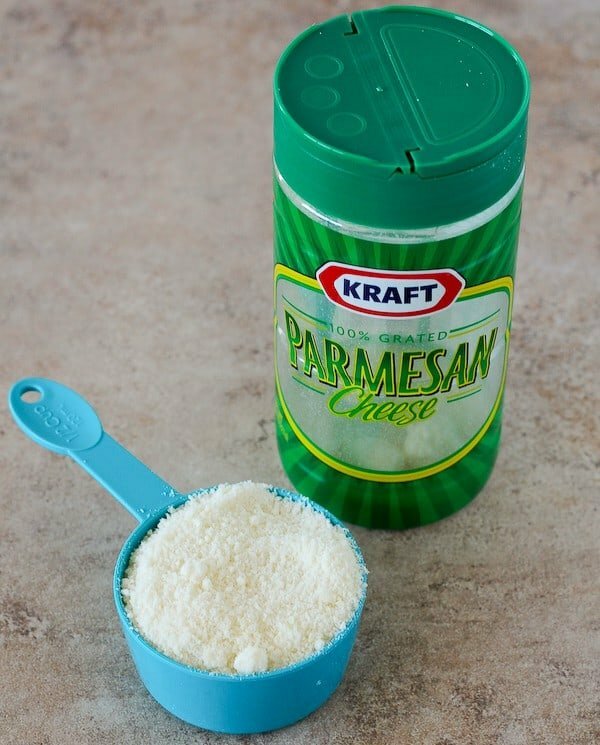 Once it is hot, remove it from heat and throw in the KRAFT Grated Parmesan Cheese. This is what makes it really, really good. There ya have it! A healthy soup recipe ready in 20 minutes that won’t make you fat and doesn’t come from a can. Add the oregano, basil, tomatoes (with liquid), and beans. Stir to combine. 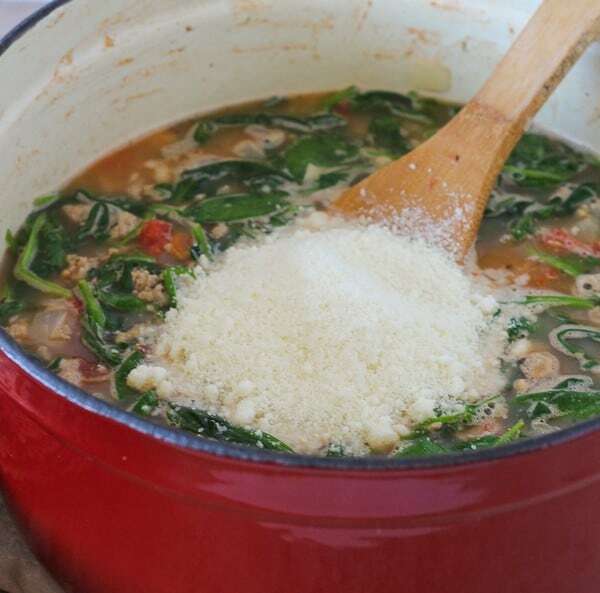 Remove from heat, stir in Parmesan and serve. 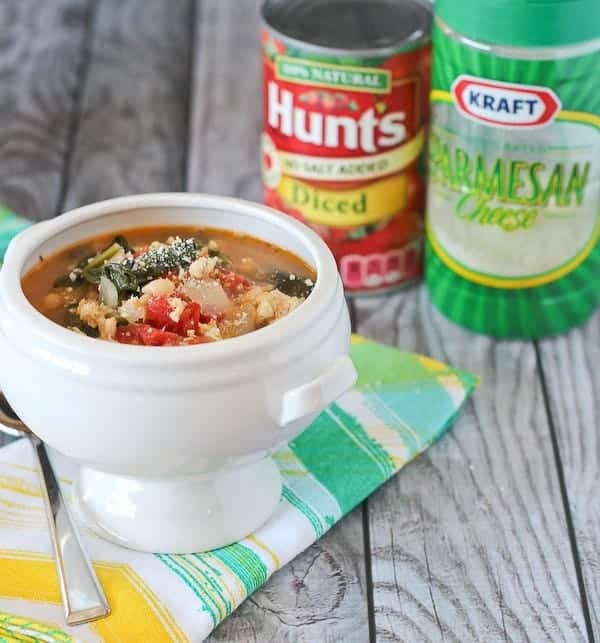 Disclosure: I worked in partnership with the KRAFT brand to develop this healthy soup recipe and I received compensation for my participation in this campaign. All thoughts/opinions are 100% my own. This was so simple that I didn’t think it would taste as good as it did! Kids loved it too. Only things I had to sub was kale for the spinach and chickpeas because that’s what I had on hand. Oh I also added a splash of red wine vinegar. Easy and good! So glad you liked this one! I’ve made it with chickpeas in the past, too. Love the red wine vinegar addition…yum yum! Thanks for taking the time to come back and leave a comment! I was very surprised that this REALLY took 20 minutes….. my family loved it last week …. and request that I make it again today !!!! 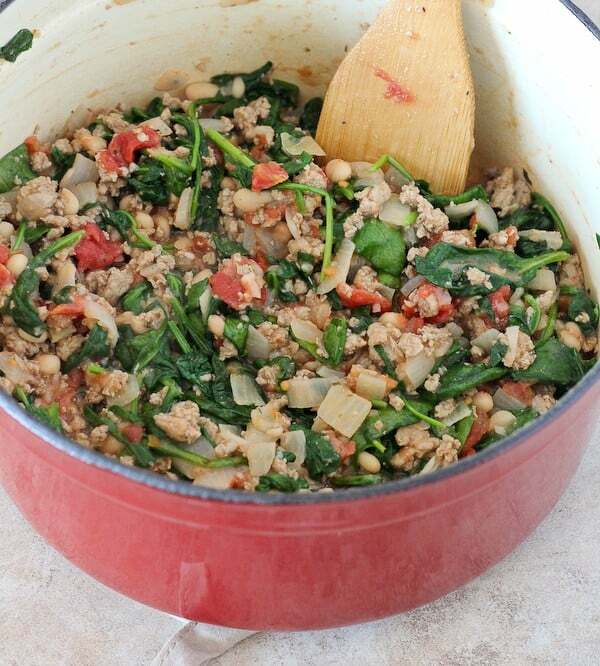 !Great recipe … I used 2 lbs of turkey and a bit more spinach … Thank you ! I’m so happy to hear you like this recipe, Emma! It’s one of our favorites, too. So great for busy nights! Thanks for taking the time to comeback and leave a comment – it means so much to me! Amazing. Just what I needed on a snowy day in missouri! So happy to hear it! This is one of our favorites, too. Thanks for taking the time to leave a comment! Would love to make this for my friend who is a new mom. I’m assuming she can freeze it? If so, do you have instructions for taking it out of the freezer, just throw in a pot and heat? Absolutely! This freezes so well! You’re right about reheating, just throw in a pan and heat. Could thaw overnight in the fridge first to make it go a little faster. This is my go-to recipe for new moms! Made this yesterday. Yummy! will definitely be making again in the near future! This soup was delicious, super easy, and very affordable- my favorite part. Only changed: for spices I used red pepper flakes and Italian seasoning that I had on hand because buying a spice I may only use once drives me nuts. One night I added some cubed baked potato, sour cream, and topped with Italian cheese blend and that was AMAZING. Adds some substance for cheap. Thank you so much! I’m so happy to hear that you like this soup as much as we do! Thanks for taking the time to come back and leave a comment – it really means a lot to me! EXCELLENT!!! I made this step by step the first time and it was WONDERFUL! Second time I made it I added vegis – carrots and zucchini. 3rd time I am going to still add carrots but also chayote instead of zucchinis. SO DELICIOUS!!!! So glad you love this recipe as much as we do! I love the additions you made. Thanks for taking the time to come back and leave a comment! My daughter and her classmates were asked to make a nutritional inexpensive dish so they could create a cookbook to take to college with them. We found this recipe and it was perfect! 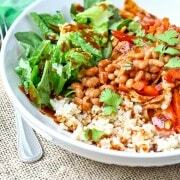 Easy, nutritious, inexpensive and delicious! The whole class and the teacher voted it the best dish. This recipe is perfect as written, we make it regularly. This comment made me so happy! I’m so happy you all enjoy it! I make this one so frequently, too. Loved this soup! Easy to make and had lots of flavor. So happy you liked it! It’s one of our favorites. Thanks for sharing your feedback! Just prepared this and absolutely fantastic and super easy! These ingredients are consistently in my pantry! This will be a rotation four variations! Thank you so much! So happy to hear that, it’s one of our favorites too! You website is ruined by all of these advertisements. Bye.. There are countless expenses (hundreds a month!) to run this FREE website (not to mention hours and hours of work each week), so yes, I have to offset the costs somehow. The alternative would be charging a monthly fee for people to access my site, and I do not wish to do that. If you are having problems with one particular ad (for example, if it won’t close on mobile), please let me know so I can get that fixed. Thank you for your feedback. 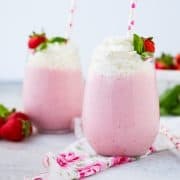 I made this last week and it’s so easy and so tasty! I had time, so simmered it a bit longer with a parmesan rind in it. Next time, I’ll chop the spinach, but this will be on regular rotation in my house. I absolutelty love this soup! I have made this several times! Its super filling and healthy and my whole family likes it even my toddler! 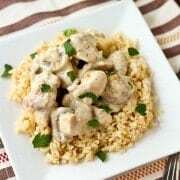 I serve it with a crusty bread and it makes a delicious meal, thank you for this recipe!! I made this last night. It was excellent! !I already want to make it for my family on our next get together.I added sliced fresh mushrooms and went long on the red pepper flake. Really, really good. Thank you for sharing. So glad you liked it! Love the addition of mushrooms. I have two other soup recipes that are similar, if you liked this one, you’ll love those too! 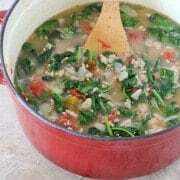 There’s Pancetta and White Bean Soup with Kale that has a great smokey flavor and also Turkey Soup with Zucchini Noodles. Hope you love those both as much as you love this recipe. :) Thanks for taking the time to comment! I made this relatively quickly following the above steps and its a great addition to any dinner. Simply delicious. I modified the recipe by adding a pint of Guinness and it added so much to the flavour. Yum yum yum! 5 Stars! I loooove this soup! It is so satisfying and delicious. So happy to hear that! It’s one of our favorites too. i ran across this recipe this morning on Pinterest & decided to try it for a quick dinner tonight because I had to feed my kids early before a sports practice and it was great. We added rice too, and except for my 7-yr. old picking out the spinach, we all loved it! Thanks for sharing such a hearty, easy, quick & delicious recipe! So glad you liked it! Love the addition of rice. 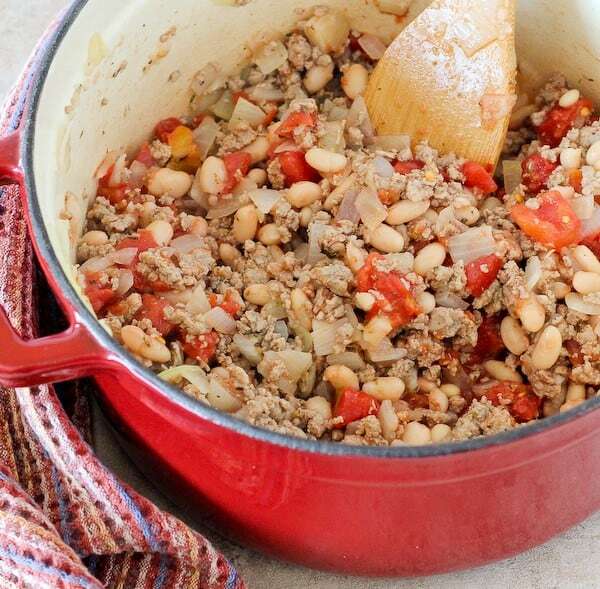 Love this idea for combining ground turkey, beans and vegetables. 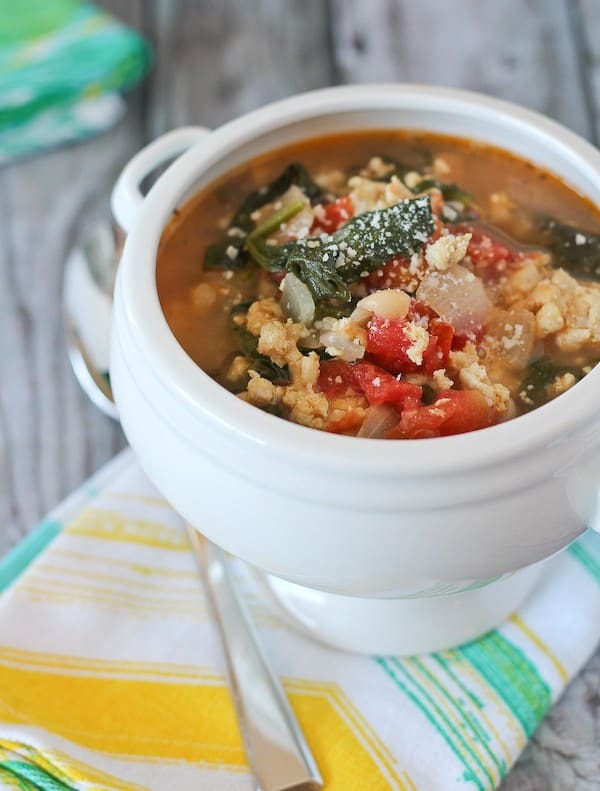 Actually a variation on minestrone. I don’t usually leave comments but I have to say this soup was amazing!!! i had a package of ground turkey and no idea what to do with it, Googled turkey soup and found this! My husband loved it, My kids loved it!! I doubled everything but the turkey because we only had 1 pound and used frozen spinach but we are a family of six and there are two quarts left. I will absolutely be making this again!!! This soup is so delish! I make it quite often! I am heading out for a girls weekend getaway next week and was wondering if it freezes well. I thought I would make it in advance and freeze – that would save me from carting all the ingredients up to our Oceanside house (yippee!) or buying everything up there. Any thoughts? Freezes great! Enjoy your getaway! I am eating this for lunch at the moment…YUM! I have made it 3 times in the last 3 weeks. I use Rotel instead of the diced tomatoes and its still yummy…oh and celery. I have to have celery. Oooh yummy! Thanks for the comment! Rotel is a great idea — celery too! I made it on New Years Day after being under the weather the day before I was looking for a recipe of ingredients I usually have on hand and this one fit the bill since I did not have time to go to the store and it was a very cold rainy New Year’s Day. We all enjoyed it with a mimosa and a few good movies. Happy New Year! I’m so happy to hear that this soup saved you from going to the store while not feeling well! And I’m even more happy to know you enjoyed it. Especially with a mimosa. :) Happy New Year! Do you think you could use vegetable broth instead? So glad you liked it! Thank you for the feedback! Hubby and I are both sick right now – sore throat, head/chest congestion etc. I added more red pepper for a little extra heat and it was FABULOUS!! Tasted and felt sooooo good. A keeper for sure. So glad you liked it! Kudos to you for cooking even when sick. Hope you’re feeling better! Wow, Girl, this looks like such a delicious soup…and I love that it is made in under half an hour! Definitely pinning!! Made this twice in one week, it was that good! Everyone loves it. I even had it for breakfast! Healthy and super delicious. Thank you!!! So glad you like it! It is one of our favorites. Do you know the nutritional info or calories for this recipe? Made this for dinner tonight, added carrots and celery and left out the spinach because I didn’t have any- it was delicious! Will definitely make again :) Might use a little less turkey next time, but other than that it was perfect! This soup is so good!!! I have made it 3 times now and it just keeps getting better. I use fresh basil instead of dried, added an extra clove of garlic, San Marizano tomatoes instead of diced, and fresh grated parm cheese and OMG…so good! Any idea of the calorie count per serving? Sorry if I missed it somewhere! I bet it is super low! Thanks for the great recipe! So glad you like it! We’ve made it multiple times as well. I don’t calculate nutritional information because it varies so wildly based on brand used and adaptations made to the recipe. There are lots of great online nutritional calculators though. Thanks for reading and for the comment! I only had ground beef, so reduced the oil to a teaspoon and went from there. Very tasty and quick Perfect for a quick lunch. I just made this today and I must say it was REALLY good. I didn’t have any onions on hand (used them up this week already lol) and I used frozen chopped spinach (thawed) and used a can of chic peas since I was out of beans, but other then that I made it the same. I had 2 cups of soup and I felt full. Great soup for a cold day for someone watching calories. Thanks so much for this amazing recipe! This really is a “pantry” soup! I am really excited to make this again and see what else I can toss in! I’m so glad you liked it! One of my friends just made it with frozen spinach and chick peas too. :) Great minds! Healthy? Check! Comforting? Check! Gorgeous? Check! Want to stuff my face with it right now? Check check!! I’m all about a meal that comes together in 20 minutes. Hello, extra time on the couch snuggled up with a book. Love this soup! My husband was just asking at lunch for a soup recipe. I can do 20 minutes. This soup sounds so tasty! I love every piece of it! 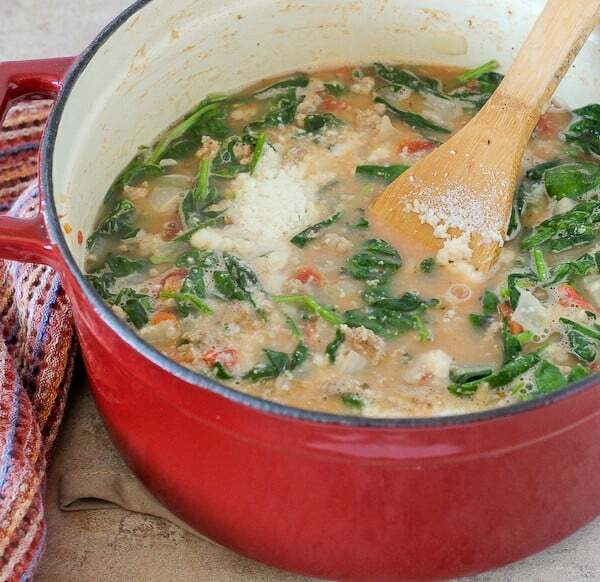 We make a similar soup with kale and Italian turkey sausage all the time!! I actually almost made it on the WZZM segment last week!! Also, I’m totally with you and freak out when I run out of spinach – hahah!! I am always on the lookout for delicious healthy soup recipes, and this fits the bill perfectly! I love your soup bowls too..so cute!